T-Mobile Arena is a LEED Gold certified facility. LEED is the preeminent rating system for design, construction & operation of high-performance green buildings. The partnership between MGM Resorts International and AEG provides the facility with access to top-tier environmental sustainability programs which will assist us in reducing our carbon footprint and provide fans with educational opportunities so that collectively we can think globally and act locally to make a difference within our own community. We are passionate about greening our resorts and our approach to environmental responsibility encourages solutions that continuously improve our operations and our products. We believe that a greener business is a better business, that through our actions we can have a positive impact on our visitors, employees, communities, and the planet. 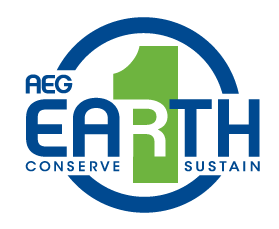 AEG 1EARTH is AEG's corporate environmental sustainability program. Through AEG 1EARTH, AEG identifies goals to guide company decision-making, measures and quantifies the environmental impact of our activities, and develops strategies and tools to improve our environmental performance. The core elements of AEG 1EARTH are our 2020 Environmental Goals, AEG Ecometrics system, and education and communication initiatives.